What each blogger experiences throughout his writing career, and what is currently happening to me is a lack of motivation and writer’s block. I’m kind of a webmaster that keeps his motivation by constantly “inventing” something, and having new ideas for this site. Don’t get me wrong – I’m perfectly aware this site is far from being perfect, but somehow I’m not particularly sure where to tunnel my motivation next. This is where you jump in: I would like as many of you possible, to suggest me what would you like to see more of on this website. Is it more optical illusions articles, new template functions, more videos? Featured games maybe? The idea I’m stuck with for some time now, is figuring how to find professional writers to help me write new articles. I’m capable of paying for each article, but I’m very picky about who I let access to this website. Is it so hard to find a person that does a good job writing stuff, had some experience with WordPress and would like to get payed for their work? Apparently it is. But let’s not change the subject. 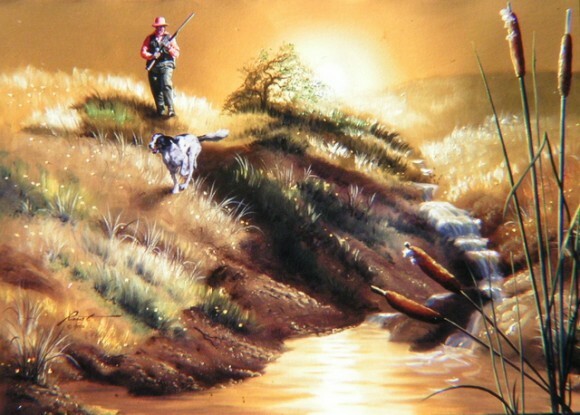 What I’m asking from you (apart from spotting the hunter’s prey in the optical illusion below), is to post your suggestions and ideas what would you like to see on this website, and keep moillusions.com as one of your favorite online destinations? Help me get some tasks, and I’ll be more than glad to brainstorm and figure out how to implement them. I see it! I see it! Nice. Took a while but I can see it now. Kwak!! It’s “prey”, not “pray”. And if his prey were really that big and underfoot, he’d better pray. Hehe, good one. The man stands just on its neck! Its a flying duck, isnt it? I see it Quack Quack. facebook user, thats not right. For those who can’t see it, look at it from a distance. See the big picture. When I first saw this illusion I thought that tha animal was some kind of Impala or Gazelle. After reading the comments that said it was a duck I looked back at the illusion and immediately saw a duck. To see what i saw the first time the duck’s head is the other animals ear and the waterfall area is part of the nose. The darker riverbank is the underside of it’s neck. I see the Mallard Duck, but I also see a wild Boar. If you leave off the duck’s head and see the bottom two cat tails as nostrils it looks like the wild Boar is foaming at the mouth. Just my opinion. I love your site. The only suggestions I have: Keep doing what you are doing. Mixing it up keeps me coming back. Thank you! I think you’re great!! I also saw a rabbit in the sand near the water. With his ears to the left. Brothers, I’ve seen the light! ooops: the duck! First… its a really good illusion, he’s just standing in the prey. Second I find the page really interesting, keep posting and innovating as you use to. how about that hobbit/trill looking thing below the dog 3/4 of the way down. I agree; just keep on posting a good mix of illusions and I’ll keep on reading and having a good time! Yeah I see a duck with a green eye. Also I like to see more animations! Whoa… he’s gonna need a bigger gun! I see it :D good one. As for the site, well, it’s great! If you need to change stuff, the only thing I’d say is tweaks to the layout. I personally enjoy the reliability of your performance and your constant drive for improvement. I think you are doing great! I just wrote couple of days ago that i’ve noticed many changes – good development. Is it of any help to you? Anyway, i agree with Patricia Ingram, Vurdlak, keep doing what ur doing! Keep it up! First, let me say that I really do love this site! I definitely prefer pictures to videos, however. With pictures I can look quickly and get the point, but with videos I have to sit through God-knows-how-much fluff to get the point. I don’t mind videos if motion is absolutely essential to the effect of an illusion, but if it can be presented as a static or animated image rather than a video, that’s what I personally prefer. The only thing you feature regularly here that I don’t care for at all is the “hidden image” type illusion, such as the one above. They’re often frustrating and, in my opinion, aren’t illusions at all – just an irritating puzzle. Other than that, just keep up the good work posting amazing and awesome optical illusions! I do love the body-painting and chalk street drawing as well. I don’t understand the spelling-comment- Unles the article reasonly has been coreckted; it says prey! wait i see 2 animals, a duck nd a goat. The only improvement I’d like to see, Vurdlak, is the opportunity to see solutions. Sometimes, like today for instance, it’s difficult for me to see the duck / rabbit/ goose (although I DO see an eagle). I’d like it if tomorrow you present us with the outlined solution. Maybe put the new illusion up for two days and then one day to see the “answer”. Other than that, I enjoy the variety you give us. It doesn’t matter if I don’t like all of them because someone else will enjoy the ones I don’t. I guess if you’re REALLY after feedback, I’d also like to see comments appear immediately. This business of waiting for approval means, I’m sure, that several comments aren’t posted until the new illusion comes up. Does the approval system matter that much? I often can’t be bothered commenting because of this filter. Other than that, I look forward to this gadget every day. I agree with everybody that you’re already doing a great job, Vurdlak. I also agree with Mike that I prefer still or animated picture over video. I disagree with Mike about the hidden image. I think most of them are cool and entertaining (like the bison, hidden tiger, zebra and this duck,) while a minority of them are somewhat lame. None are frustrating, except when it was a bogus like that cello player pic the other day. I guess it’s all down to taste. Some people like thiseriffic while others like thatamajig. And you already varied your post that I think you’ve pleased everybody. Have a good day, man! The Mallard of course, and the other looks like a Large cat (tiger,lion,jag) the water fall is its nose all snarled up the 2 leaning cattails are the opening of the nostril and the mouth, and where the waterfall runs into the pool is that little beard that cats have, the divit in the hill or shadow is its eye. Good illusions, gGood pictures; that’s what we’re here for. Get the fundamentals right, the rest is just window dressing in the grand scheme of things. I’d love to be an article writer for you but sadly enough, as you are so picky, i don’t fit any of those discriptions. But I’m willing to work free. But I doubt you’ll actually consider me. Nice illusion by the way. Didn’t take me that long to see it. Cause I had a trick when I put my cursor over the picture it said duck so I knew what I was looking for. And it would be very coool if you featured some games that had to do with optical illusions…if that’s even possible to find…. We need more 3d illusions. Is that a duck hiding in the shadow? The only problem I have is your diction. Please have someone edit your articles. The articles are good…heck…great…but I get distracted by the bad word usage or sentence structure. I’m not trying to be nit-picky, but “cleaning” it up a bit would go a long way. Example: “Today’s illusion the best in its class”. Without the “is” after illusion, the reader gets the “point”, but it is difficult to read. Thank you for listening. hey Vurdlak, just was thinking if it would b possible to see t comments and t pic. it’s annoying 2 me that i have 2 keep scrolling up & down, when i can’t find i illusion myself and am looking for hints in t comments. cool illusion! I love coming to this website. I think you should keep going with illusions. I find it interesting reading your articles about their origin/history then having the experience of seeing them/finding the missing piece/what’s wrong/etc. i’m not getting this one at all ..
the hunter is standing on it…. All I see is a shadow of a duck in flight underneath the rapid/waterfall facing the hunter…. His prey is the goose. You can see the goose’s head to the right of the hunters right foot, and then just follow the dark outlines and you should see it. Well, I got the fisherman 1 instantly, but this 1 eludes me. I was looking for another person or somthing. But all I came up with was SPOILER!>>>>>A very large duck.<<<<<SPOILER! The hunter is standing on the neck of the duck the dog is the white collar the shore is the wing span. Just guessing, but I think the big dark brown patch looks like a bear lying down as if it were a “bear rug”. I love the illusions! Keep it up. I’m not sure… but is that brown area an elk or something. And the bushes are it’s antler?? If you were going to pay for anything, I would suggest paying artists for original optical illusions. I am sure that there are many starving artists out there who would love to make a couple of bucks for their art, especially in this economy. They could also write a bit about themselves and their art as the intro to the picture. Getting their art seen on a popular website like this would be an added bonus. My favorite types of illusions are the M.C. Escher-like stuff, especially when it is combined into an interesting picture. This is a wonderful site. I will continue to love it even if it is not changed at all. I like the idea of changeable templates, you know, every visitor would able to change the color of the website’s layout! Take a look at metallica.com, which has something like that. I inserted my website wrong… maybe a “edit comment” button is a good idea as well..
Don’t get me wrong, I love this site! suprising nobody sees the second prey. The brown part in the left bottom corner is a rabbit! He’s laying on his side, his ears towards the hill! keep up the good work! love these illusions! Ummm…elk? Rabbit? No way. Just a duck. I see what u guys r calling an elk an rabbit but they’re just not clear enough. There’s no way those were intentional. Now ur just finding shapes the same way kids do when looking at clouds. Just as Serj said. You should make an ipod touch/iphone app! Of course there is a RABBIT. In fact the rabbit was the first thing I saw. Looks more like a goose to me, though. This is great site. Please stop beating yourself up! Squint, then look at the land just below the sun! I think there’s definitely an elk’s head in the picture and… a boar. The dog is it’s nose and the dog’s legs are it’s front teeth. It’s deffinately a mallard. The man’s shadow is the head and the dirt is the body. I have a suggestion for your articles: I think you should separate the introduction and the description of the illusion itself into two chunks. You should have one paragraph where you talk about whatever you want to talk about before you get down to the actual illusion in question. Then you should have a heading, and below that heading is where you “get to the point” so to speak. This paragraph should be as concise as possible. The reason I make this suggestion is that there are many articles where you do a lot of writing about things that don’t realate to the illusion. But I’m sure many people will just want to quickly get to the illusion itself, especially if they are just scanning through a few illusions and want to quickly find out what the “point” is of each one. Having two separate parts to your article will allow people who just want to get to the illusion to skip down to the essentials, while people who enjoy reading everything you have to say will be able to read the whole thing. In either case, breaking up a large amount of text into two chunks can only be a good thing. Probably you grew bored from all those Ultimate Galleries I’ve posted during the past week, never the less – I’m sure you’ll love this one. At least if you have nerves going through each photo in this gallery. But before we continue, I’d like to show you an interview I did for Environmental Graffiti website. The interview can be found here. If you have a spare minute, I welcome you to read it and you are invited to post your comments here (you may even see a nasty photo of me). Now let’s explain what all those photos are doing here. If you visited any major Europe city over the past decade, I’m sure you’ve came across all those people who pretend to be a statues, standing on the street somewhere in downtown, during the summer. They are usually painted in gold, standing so still that you hardly can believe they aren’t statues at all. By freaking out the passers by, they earn some spare coins. English Russia reported that all those performers came to Russia recently, more precisely they visited city of Sochi to participate in the biggest Living Statues Contest, the world has ever seen. Now these “living statues” bring our Body Paint category to the next level, don’t they? Which of them do you think did the best disguising job? Which one did you favor the most? Tell me, tell me! i think thy are after the crocodile hidden on left side of the stream…its body is somewhat covered with mud…. Singlish talk!!! aiyoo… why u go put the word duck when put mouse over the picture!!! Like it? there’s a rabbit in the grass..
great site.. just needs more cowbell. From the photo from my point i think it is a duck ! is the bush it? thats whats causing the shadow??? I enjoy skimming through sites to satisfy my lust for eye catching absurdities and stories that cultivate and enlighten me, thus making me more worldly and knowledgeable. My suggestions for your site is to tantalize the mind using enticing subject matter, and then, display a mosaic of visuals ranging from the very beautiful to the awkwardly bizarre. If we were to separate the page in three columns with three rows, almost like tic tac toe squares and equally disburse the images and text but limit advertising to the second row’s first and third columns. You can start alphabetically with subject matter and also, do an email signup subscription for your readers so that they don’t miss a thing! I aggree with the two sections, separating thing. When I read your example, I skipped straight to the illusion part accidently! Also, is there anyway you could make it look more fun? Some websites have appropriate ads for their website. E.g. a sport website has sport betting ads, etc. Is there any way you could do that? i can see a duck, but it is not definite. There are many things that COULD be there in the shadows. Thankyou for being a great website, sorry if this is long and boring. Finally saw the duck after a long time starring at this! Really interesting visual teaser! lol jks hes on it. I don’t see– OMIGOSH the shadow has the ducks body and head and the darker mud on the bank is one of the wings, the other reaches up to the tree! If ‘NES ‘Duck Hunt’ is anything to go by, that man’s going home empty handed. duck-the patch of green grass is the ducks eye and the white to the left is the beak and the body is the dark dirt going into the water. The whole dark area is a duck, the hunter is standing on the duck’s neck. If you look at the tip of the duck’s right wing, you can see a upside down rabbit too. Does no one else see the head of a man? or 2? It’s the shadow of the duck!